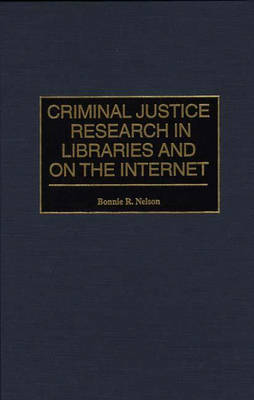 Library research has changed dramatically since Marilyn Lutzker and Eleanor Ferrall's Criminal Justice Research in Libraries was published in 1986. In addition to covering the enduring elements of traditional research, this new edition provides full coverage of research using the World Wide Web, hypertext documents, computer indexes, and other online resources. It gives an in-depth explanation of such concepts as databases, networks, and full text, and the Internet gets a full chapter. The chapters on bibliographic searching, the library catalog, and comparative research are almost totally new, and chapters on indexes and abstracts, newsletters, newspapers and news broadcasts, documents, reports and conference proceedings, and statistics reflect the shift to computerized sources. The chapter on legal resources discusses the wealth of legal information available on the Internet. A new chapter on library research in forensic science corrects an omission from the first book. With the growth of computerized indexes and the Internet, more and more researchers are admitting that they feel inadequate to the new tools. Librarians themselves are struggling to keep abreast of the new technology. This book will help students, practitioners, scholars, and librarians develop a sense of competency in doing criminal justice research.